An abandoned dog that was found "tiny, starving and pregnant" inside a tree trunk in the California countryside has a new, loving home. 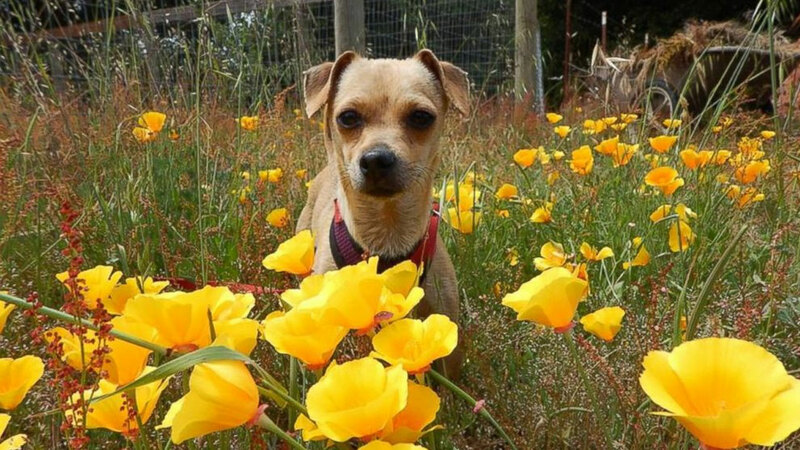 Boo, a Chihuahua mix, was found in the tree near Sebastapol in April, according to Sonoma County animal control officer Shirley Zindler. "I think she was dumped there, and she was desperate to find shelter, so she got inside through the split at the bottom of the trunk," Zindler told ABC News. "She'd probably never been handled, and she was very afraid of people, so it took over an hour to coax her out. But my scrambled eggs I was having for breakfast that morning did the trick." Boo went into labor shortly after she was rescued, but unfortunately none of the puppies survived surgery. Zindler says adoption requests poured in for Boo from all over the country, from as far away as New York City, though the dog found a new home with Kim Stohlman in California. Boo was welcomed to her new permanent home last weekend, and her transition is being documented on a Facebook page called "Life of Boo." "She slept for an hour by my hip and let me hold my hand on her back and side and then she stretched and rolled and woke with my hand near her tummy and didn't fret at all," Stohlman wrote on Facebook Thursday. "Then the other dogs barked and the moment was gone and she shot off the bed and went to join the other dogs!" Stohlman says Boo is doing extremely well in her new home, and is hoping the story will inspire others to adopt dogs from their local shelters.